It has been cold, warm, and wet this spring, which will be great for the summer But it’s made for a difficult time in trying to start and finish the usual spring garden chores. Here is a June list, a few days early. Eliminating at least half of your lawn is a great green garden step, but if you’ve decided to keep your lawn areas, take care of them! Mowing and feeding your lawn areas is important for the continued health of the lawn. It will encourage the lawn to grow thick and green and help to keep it weed free. Mowing will prevent seeds from forming on the grass or any weeds you may be cultivating, thus keeping them from spreading to other parts of the lawn. It is recommended to fertilize your established lawn several times through the season, but especially important in the spring. Choose a fertilizer that is suited for the type of grass you have and select slow-release, granular complete fertilizers for established lawns – they deliver a consistent supply of nutrients during the lawn’s fastest growth times. Fertilize at least one more time during the growing season, and apply a winter formula in early fall if one is recommended for your lawn type. Don’t worry if you forget, research says that once a year, whenever you remember, is actually fine for established turf. You say you don’t have weeds in your lawn? You are a lucky gardener! For those of us who do, there are weed formulas that you can apply in the early summer months if you missed the April deadline. Again it is important to know what type of weeds you have and choose the most appropriate formula accordingly. Be advised if you are top seeding areas; you have to be very specific that you apply weed control that won’t affect the grass seed. As we try to be as eco-friendly as possible, we recommend you try natural formulas and products first. As the early showers start to slow down, be sure to water your entire garden regularly. Although it doesn’t seem so, it is time to get all the warm weather vegetables in the ground. The soil temperature is warm enough and the cool nights aren’t going to be a problem for most plants. Be careful about working the soil when it is too wet though. After a good rain wait until the soil easily flows through your fingers before you get in and dig around. Many of you have asked about drought resistant flowers for planters and boxes. Planters need to be watered once or even twice a day during the heat of summer. We have some suggestions for you if you are using annuals; begonia, salvia, marigolds, gazania, gallardia, portulaca and zinnias among others, all will tolerate drier conditions. They all come in many colors and sizes to choose. If you pair them with perennials the list is endless. Here are only a few of the many suggestions for perennials: dianthus, echinacea, helichrysum, lavandula, perovskia, rudbeckia, sedum and thyme. Be adventurous and combine different sizes, shapes and colors of foliage and flowers to make a big impact. Enjoy your garden; and always plan ahead for each changing season! There are few more spectacular sights in the early summer garden than a magnificent rambler rose in full flower. Typically the rambler’s flowers are small to medium-sized, they hang in large clusters or panicle, creating a very dramatic affect. Their scent or fragrance is typically musky wafting wonderfully through the air. 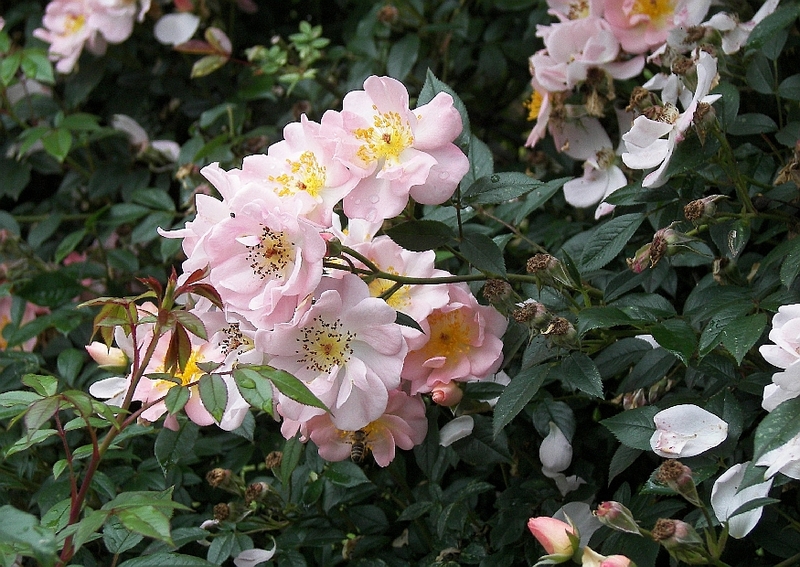 Ramblers are variable group of roses and very versatile too. Some are quite vigorous and will scramble up a neighboring tree if you let them or consider training up a pillar onto a pergola or the top of garden wall or fence. 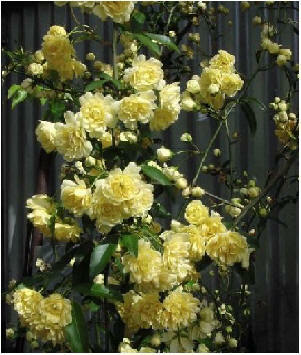 GardenWise has these roses in inventory and can easily incorporate them into your overall garden design. One such rose is the Rosa banksiana ‘Lutea’, with beautiful vibrant yellow flower clusters. Charleston, SC, has adopted the Lady Banks rose as it’s own. 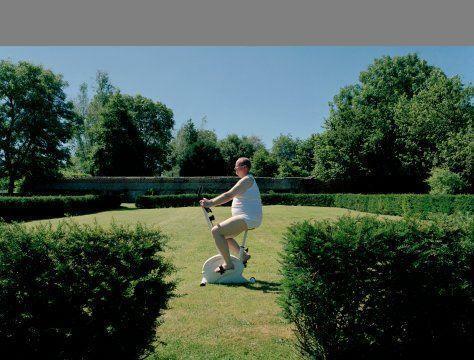 Perfect to train on a pergola. pillar or on a wall. Most ramblers flower once but here are a few favorites that bloom repeatedly. 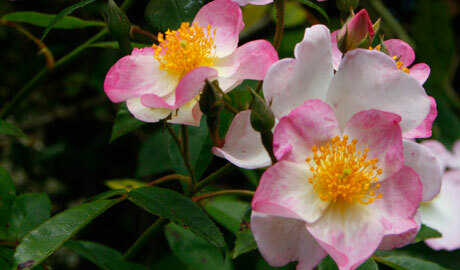 The Rosa ‘Francis E. Lester’ which has single blush pink flowers and is particularly tough, reliable & free flowering. A vigorous but not overpowering large shrub or climber. Huge heads of well spaced single, white and pink flowers w/a strong perfume. Ideal as a small tree climber. Small hips in autumn. 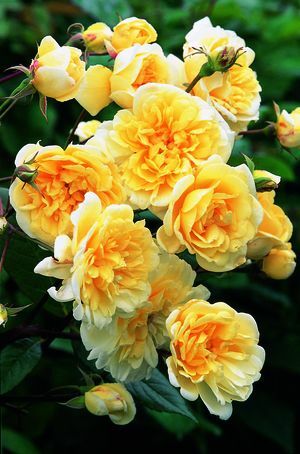 One of my personal favorites is the Rosa ‘Malvern Hills’, it is true repeat bloomer and in my garden bloomed from early June until the first frost The flowers are clusters of full buttery yellow and very pleasant musky scent. Seems to very vigorous and pest free. Another great ramblers is Rosa ‘ Open Arms’ a pale pink simple flower with bright yellow center. Superb vigorous grower with dark glossy semi-evergreen foilage offsetting an abundance of double blush colored flowers. This is a colorful favorite of the old cottage garden and a vigorous healthy plant. Some of the ramblers have a strong fruity scent, such as the yolk-yellow Rosa ‘Goldfinch’. 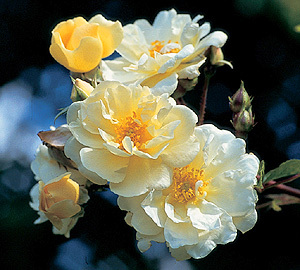 ‘Goldfinch’ is a hardy, arching rambling rose producing masses of rosette-shaped double, fragrant, deep yellow fading to creamy white flowers and abundant light green leaves. Gardens Give Good . . . Exercise! 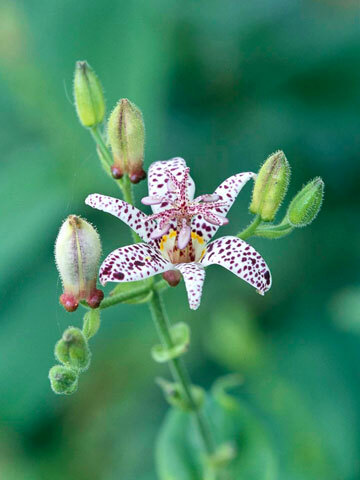 With its beautiful orchid-like white flowers with purple flecks and graceful arching growth habit, Toad Lily (Tricyrtis hirta) compels anyone who gazes upon it to stop for a closer look. A must have for any garden, the Toad Lily blooms from late summer through the fall season and happily grows in the shade, providing an unforgetable eye-catching colorful interest. The plant typically stands 2-3 feet tall and 1-2 feet wide, and can be planted in a border with moist well-drained soil, or in a shady nook under a grove of flowering trees for a fantastic fall display. Toad Lily is a GardenWise all-time “must have” favorite.